I samband med Jin Shin Jyutsu instruktören Nathalie Maxs självhjälp/egenvårds-kurs i Uppsala lö-sö 15-16 november erbjuder vi ett gratis föredrag med Nathalie, fredag kväll 14 november. Tid 18.00-19.00, och Nathalie kommer också att vara kvar efter föredraget för att svara på eventuella frågor. Platsen är Shendao Hälsocenter i Uppsala, Vretgränd 16 (två kvarter från Centralstationen) och det är också där helgkursen kommer att äga rum. The power of our hands is no secret to massage therapists. The ancient art of Jin Shin Jyutsu® takes this knowledge to a new level, offering an easy-yet-sophisticated self-care method that is accessible to everyone, at all times. According to the philosophy of Jin Shin Jyutsu, we have 26 points of energetic density on both sides of our body. These points protect us from major energetic breakdowns, and are called safety energy locks. In case our energetic current isn’t in balance—on a physical, mental or emotional level—several of these points will lock, and dis-ease or discomfort will remind us to restore our balance. In Jin Shin Jyutsu, our hands work as jumper cables that enable us to recharge our body, mind and spirit and restore a harmonious flow of energy, which is key to health and balance. For example, by simply holding your thumb, you can help boost your stomach and spleen energy and harmonize the plethora of symptoms that may occur when those energies are out of balance. Holding your thumb can assist in easing a broad range of issues, including upset stomach, nervousness and exhaustion. See the photo below for how to perform the thumb hold. Hold your thumb until you can sense a pulsing in it; or, if you don’t feel your pulse easily, hold it for about three minutes. Once you perform the technique a few times, you will quickly develop an intuitive understanding of how long you need to hold it in order to feel relief. In addition to your thumb, you can perform holds on other fingers. 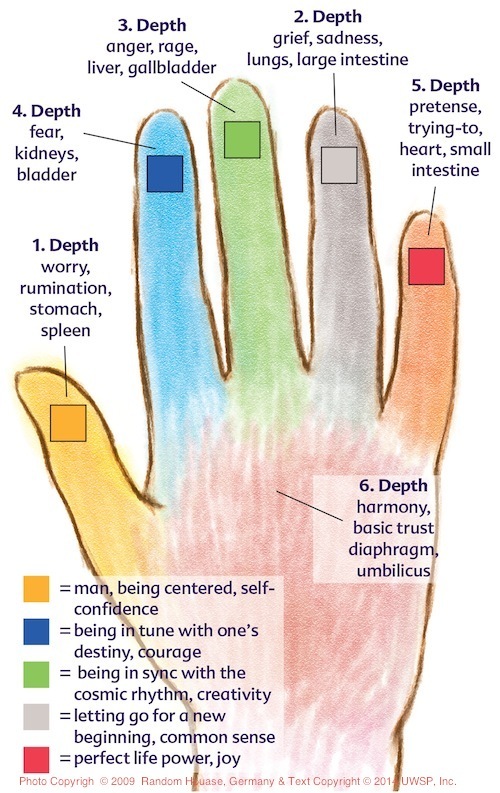 See the chart on the right for information on which fingers help balance different body parts, or assist in relieving worry, anger, sadness and other negative emotions. Gently holding our fingers addresses physical, mental and emotional concerns, as our fingers are the main entry points to all energetic highways of the body, such as the vertebrae, organs and emotions. In addition to simple finger holds, Jin Shin Jyutsu also utilizes flows, intricate choreographies for our hands which help us take care of our bodily fuse box. You can learn these more complex practices and adapt them to your self-care routine by taking one of the many continuing education courses available. For me, my family of five, and thousands of practitioners, Jin Shin Jyutsu has become indispensable, as we can apply it anywhere, anytime. Try it for self-care and tap into the repairing properties of this simple healing art. Kathrin Stengel, Ph.D., is a certified Jin Shin Jyutsu practitioner, author and philosopher. She co-founded the philosophical studio and publishing house Upper West Side Philosophers Inc. (www.westside-philosophers.com), which recently published the book and card set Health Is in Your Hands: Jin Shin Jyutsu®—Practicing the Art of Self-Healing, by Waltraud Riegger-Krause. By: Eve O. Schaub | Once upon a time, I was healthy; at least I thought I was. Sure, I lacked enough energy to get me through the day, but with all the commercials on TV touting energy drinks for America’s tired masses, I always assumed I wasn’t the only one suffering. And sure, everyone in my family dreaded the coming cold and flu season, but again, I thought come January everyone develops some degree of germophobia. According to this theory, all of these maladies and more can be traced back to one large toxic presence in our diet… sugar. I took all of this newfound knowledge and formulated an idea. I wanted to see how hard it would be to have our family — me, my husband, and our two children (ages 6 and 11) — spend an entire year eating foods that contained no added sugar. We’d cut out anything with an added sweetener, be it table sugar, honey, molasses, maple syrup, agave or fruit juice. We also excluded anything made with fake sugar or sugar alcohols. Unless the sweetness was attached to its original source (e.g., a piece of fruit), we didn’t eat it. Now that our year of no sugar is over, we’ll occasionally indulge, but the way we eat it is very different. We appreciate sugar in drastically smaller amounts, avoid it in everyday foods (that it shouldn’t be in in the first place), and save dessert for truly special occasions. My body seems to be thanking me for it. I don’t worry about running out of energy. And when flu season comes around I somehow no longer feel the urge to go and hide with my children under the bed. But if we do come down with something, our bodies are better equipped to fight it. We get sick less and get well faster. Much to my surprise, after our no-sugar life, we all feel healthier and stronger. And that is nothing to sneeze at. Eve O. Schaub is the author of Year of No Sugar: A Memoir. She holds a BA and a BFA from Cornell University, and a MFA from the Rochester Institute of Technology. Her personal essays have been featured many times on the Albany, New York, NPR station WAMC. You can join Schaub’s family and take your own Day of No Sugar Challenge on April 9, 2014. Credits: Everyday Health, where this article was originally featured. Please enjoy the following excerpts…from the speech given by David Burmeister at our Christchurch seminar, and also at the 100 year celebrations. We invite you to hold your mudras, or enjoy some self help whilst you read…. It was late in 1946 at the home of a Mrs. Sato that Jiro Murai met one of his most prominent students, Mary Mariko Iino, later to become Mary Burmeister. While Mary was at the Sato home teaching English to a group of students, she was told that Sensei was coming. Mary recalled that there was great excitement in the home because this was an unexpected visit. She had heard her English students speak of their mysterious Sensei with reverence but didn’t know much about him. She asked to excuse herself but was told that Sensei knew she was there and wanted to meet her. When Jiro arrived and first met Mary, he said that he had a gift for her and asked if she would bring it back to America. Not knowing what was being offered, and without hesitation, Mary said yes. And thus began the journey that Mary would embark upon and cherish for the rest of her life. Mary soon joined the Jin Shin Jyutsu lecture series that was about to begin and with the same commitment, love and excellence that were the hallmark of her life, she studied and embodied the teachings of Jin Shin Jyutsu over the next 6 years. Not long after Mary began to study with Jiro Murai, her father Uhachi Iino, who had been detained in a US internment camp during the war, returned to Japan and he also became a student of Jin Shin Jyutsu. Together, Mary and Uhachi Iino developed a deep and lasting friendship with Jiro Murai. Mary left Japan and returned to America, to bring the gift that she had been earnestly studying for the past 6 years. Uhachi Iino remained in Japan for a couple more years, working on clients; many sent to him by Jiro Murai and continued his studies of Jin Shin Jyutsu. Uhachi was instrumental is keeping Mary up to date with any new discoveries from Jiro, who constantly developed his theories and created more standardized flows. When Mary left Japan there were a total of only 15 Safety Energy Locks identified. Safety energy locks 16-23 were developed between 1953 and 1956. Finally, Jiro created Safety energy locks 24-26 before the beginning of his final lecture. The first time all 26 safety energy locks appeared together were in 1957 during his final lecture series. After Mary’s return to the US it wasn’t long before the word got out in Los Angeles, about a little Japanese woman who had an amazing gift for helping people alleviate their illnesses. Before long Mary found herself working from early in the mornings until late in the evenings sharing her healing hands with the many people who found their way to our home. No one was turned away. Then in 1965, 12 years after her return from Japan, Mary began to teach Jin Shin Jyutsu to others. Her first class was taught to a group of Chiropractors who learned of Mary from her neighbour, whom she had treated for migraine headaches. Mary’s purpose in life was now being realized as scores of students flocked to study with her. Southern California in the 1960’s became the setting where Jin Shin Jyutsu first took hold in America. This was a very unique time in the United States with so much growth in consciousness, much of it coming from the east. So the popularity of Jin Shin Jyutsu seemed very natural and fitting for the times. Mary’s students spanned the spectrum of lifestyles and perspectives. I remember her working with Lama’s and with Nuclear Physicists, with Movie stars and with hippies and Mary evolved and learned from them all. This was the dawning of the Age of Aquarius and Mary’s students wanted to know how Jin Shin Jyutsu related to a vast array of subjects. Certainly Jin Shin Jyutsu has close ties with modern science and Traditional Oriental Medicine. However, through the questions and interests of her students, Mary also discovered Jin Shin Jyutsu’s interconnectedness with astrology, numerology, Kabala, the Tarot and many forms of ancient wisdom. Mary was truly a pioneer of higher consciousness and this was one of her greatest contributions to the Art of Jin Shin Jyutsu: her deep awareness of the significance of the “Now”, of this “breath that I am”, and how she embodied this wisdom and was able to convey it to her students. She loved to speak about the “No Thing”, the ancient concept of emptiness and then bring it to life for her students through words and actions. Like Jiro Murai, her studies and developments in Jin Shin Jyutsu never ended. Some of Mary’s other great contributions to the Art of Jin Shin Jyutsu includes developing the Theory of the Depths, enabling us to view the human being and understanding its connection to the divine, and then show us how to utilize this awareness to help any project within the body. Mary also placed considerable emphasis on the practice of self-help and spent many years developing this knowledge and creating flows for the simple application of Jin Shin Jyutsu for Myself, so that each one can be their own source of healing and their own testimony. In March of 1990 Mary fell at home sustaining a serious head injury which abruptly ended her career as our loving and gifted teacher. This immediately initiated our new teachers into presenting Jin Shin Jyutsu and they continue to inspire our student to this day. The many treasures that Mary Burmeister and Jiro Murai left behind are what we are here to celebrate today, and always. As Mary loved to say, “We are all divinely guided”. Today with reverence and humility, we give thanks for the blessing of finding our way to the beautiful living legacy that is the Art of Jin Shin Jyutsu. It is my pleasure to invite you to a Jin Shin Jyutsu Self-Help class in Uppsala, Sweden on the weekend of the 15/16 November! Nathalie Max, an authorised Jin Shin Jyutsu instructor since 2002, will be here from Paris to lead this course. The Self-Help course is for review as well as new students… all are warmly welcome! To attend this course before a 5 day seminar will help you to know the essential foundations. To attend it afterwards will help you to come back to simplicity. Nathalie will introduce the basic concepts and daily practice of Jin Shin Jyutsu: To discover or rediscover what you have already in you, the keys to complete harmonization. The course will be based on Nathalie’s extensive experience of Jin Shin Jyutsu and her knowledge of Mary Burmeister’s Self-Help Book 1, Jin Shin Jyutsu Is. The course will take place on Saturday the 15th of November from 9.00 am to 5.30 pm and on Sunday the 16th from 8.00 am to 3.30 pm. The cost of the course is 2300 sek. Since Nathalie is traveling from France to give this class, a deposit of 770 sek is requested to secure your space. The deposit is fully refundable up until the 15th of October in event of a cancellation. The deposit and full course fee may be paid by transferring the money to the bank account with details below. NOTE: Please add your name as a note so we know who the payment is from! Please let me know if you have any questions. There will be the possibility for a limited number of participants to sleep on mattresses at the class venue, Shen Dao Health Centre (2 minutes from the Uppsala Central Station) for a cost of SEK 150 per night. As soon as you have decided to come, please let me know. Nathalie is planning to be back in Uppsala to teach a 5 day Jin Shin Jyutsu seminar 29 April to 3 May 2015.
but we will also sell the book at the class, if you rather buy it then. I have been participating in some macrobiotic workshops earlier this year, and we cooked some delicious and healthy food, I found this article that cover some of those things we cooked. Enjoy! These vegan blood-cleansing foods will gently detox your system. This salty paste is made from a bean (usually soy), sometimes a grain, salt, and a bacteria called koji. It’s fermented, meaning it’s full of live probiotics and enzymes. It acts like yogurt, but without the icky problems of dairy. Eating miso in soup—its most powerful, healing form—is great for digestion; is a huge boost for the immune system; is alkalizing to the blood; and packs some protein, iron, vitamins, and minerals. Basically, it keeps your body balanced and happy. Treat yourself to homemade miso soup every day. Just make sure you’re buying high-quality miso paste that’s made with barley and aged at least 2 years. The powdered stuff isn’t going to give you the same benefits, and the same goes for the soup served in Japanese restaurants. That miso’s usually pasteurized (so the enzymes aren’t alive anymore), and the broth is often super-salty, is made from fish stock, and may even contain MSG. Just like miso, these sour little fermented gems are full of live probiotics and enzymes that help your body absorb nutrients and put them to good use. They’re also a boost for the immune system and act as antioxidants. The pickles that will do your body the most justice aren’t the jarred dill variety you normally think of. In fact, most supermarket pickles aren’t naturally fermented and are made with a lot of preservatives and unnecessary ingredients like sugar. Look instead for unpasteurized pickles or sauerkraut in the refrigerated section of your health food store. Use them to add a tasty, tangy, crunchy, salty punch to any meal. Because these guys are pretty salty, though, don’t go overboard and, if you can, rinse them lightly before digging in. You only need about a tablespoon each meal to reap the full benefits. These super-sour pickled plums are alkalizing to the blood, which means they help counteract acidity in your system—a major bonus if you’re just starting to clean house. Eat a quarter of an umeboshi plum with your grains a few times a week and you’ll also enhance your digestive health. The great news, too, is that these are pretty easy to find. Check out places like Whole Foods Market or your local natural or Asian market. This long, brown root has an earthy flavor with just a tiny bit of sweetness. It has unbelievable restorative powers and is used to cleanse and purify the blood, support digestion, scrub away toxins, and even help lower blood sugar. It has more protein, calcium, and phosphorus than carrots and is a great source of potassium. I love adding it to soups, stews, and stir-fries, and dishes. Some farmers’ markets carry it, but more often you’ll find it stocked in Asian markets and health food stores. Though it looks kind of like a huge white carrot, this miraculous veg is actually a member of the radish family. It’s a natural diuretic, which is perfect for when you’ve been a little naughty. It has a spicy, pungent flavor when raw but becomes meaty and sweet when cooked. These have been popping up in more and more regular supermarkets, but your natural market or Asian market should have you covered. In Chinese medicine, they say that foods that look like certain body parts are extra fortifying for those organs. Lotus root—which looks like a long, white tube—is a breath of fresh air for our bodies. It helps circulate and enrich our blood, gives us more energy, nurtures the heart, quiets digestive issues, supports the stomach, and flushes out toxins. Chopped and steeped in hot water as a tea, it’s a curative remedy for a chest cold or phlegmy cough. You’ll most likely find lotus root in an Asian market, but make sure that the vegetable is cream colored—white lotus root may have been bleached. You can also order dried lotus root online and reconstitute it with a little hot water before cooking. There’s something almost mystical about these calcium- and mineral-loaded gifts from the ocean. Sea veggies like nori, hijiki, arame, wakame, and kombu are high in protein; alkalize and detoxify the blood; can reduce blood pressure and inhibit tumor growth; have anti-inflammatory properties; and are amazing for your hair, skin, teeth, and bones. Consider these guys an important medicinal food to be eaten a couple of times a week. They’ll keep you glowing and beautiful and beyond healthy. Plus, they’re so tasty. Kale, collards, turnip greens, mustard greens, watercress, and bok choy are not only loaded with minerals that make the blood strong and energized, but their chlorophyll can help you feel relaxed, open, and happy. They are really, truly a crucial part of your diet if you want to feel amazing. But please don’t just throw greens in your smoothie and call it a day. When plants get all ground up before we eat them, we assimilate them differently. Blending is not the same as chewing. Also, when you’re adding them to a smoothie, you’re probably adding in other sweet treats like fruit and sweeteners. While that’s completely kosher every once in a while, it isn’t the kind of pure, green loveliness you want to indulge in more often. While all beans are amazingly good for you, these varieties pack an extra punch. Black soybeans can help cleanse your system if up until now you’ve been overdoing it on animal foods or baked flour goodies. Adzukis are known for their supercharged healing properties, especially for reproductive function, and black beans are the most antioxidant rich of the entire legume family. Har fått en ny sändning med Jin Shin Jyutsu självhjälpsböcker från Scottsdale, Arizona om det är någon som vill slippa besväret att skicka efter själv från USA och vill köpa av mig, så har jag till salu: Självhjälpsbok 1, 2 och 3 + Happy hands (Mary Burmeister), och också boken Jin Shin Jyutsu for your animal companion (av Adele Leas). Vill man skicka efter böckerna själv kan man antingen köpa böckerna separat, men man får rabatt om man köper 1+2+3 tillsammans, och man kan också lägga till Happy hands och få ett paket om 4 böcker. Animal boken köps separat. Och om Happy Hands – den boken är bra för att lära barn enkla Jin Shin Jyutsu saker dom kan hjälpa sig själva med, en gullig liten bok med trevliga illustrationer. Och jag säljer böckerna till självkostnadspris, jag lägger bara på det som portot har kostat mig från USA, så det är billigt! Veckans tema är “de vita gifterna” och i dag är mjölet i fokus. Möt matskribenten Cathrine Schück som blev av med sina svampinfektioner när hon slutade äta mjöl och andra snabba kolhydrater. Stig Bengmark, professor, Ulf Kilman, kinesiolog och Anki Sundin, nutritionist diskuterar.